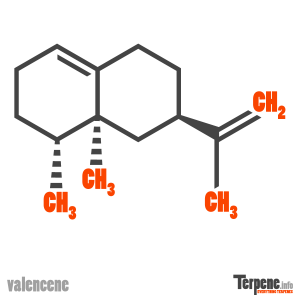 Valencene is a bicyclic sesquiterpene with a sweet, fresh, citrusy, grapefruit, woody, orange odor. The terpene has been shown to be toxic and repel ticks and mosquitoes at lesser concentrations than DEET and without the toxicity to humans. Valencene has also been deduced to be and anti-inflammatory, lower the levels of inflammatory markers in macrophages. Alaskan yellow cedar oil was tested for bug toxicity and repellent activity by the CDC against deer ticks and Aedes aegypti (L.) adults. Mosquitoes were shown to be killed with small amounts of a derivative of valencene after 24 h. This derivative was also shown to effectively in repelling ticks with less than 2 times more of a concentration than usually used with DEET. The ability of these natural products to kill and repel arthropods at relatively low concentrations represents an alternative to the use of synthetic pesticides, like DEET, for control of disease vectors. Valencene in the oil of Cyperus rotundus rhizomes was shown to increase heme oxygenase -1 expression, which was correlated with significant inhibition of iNOS/NO production in LPS-activated RAW264.7 cells. Valencene also showed inhibition of high mobility group box-1 in LPS-activated macrophages and increased survival rates in cecal ligation and puncture-induced sepsis in mice. It was concluded that through HO-1 induction, anti-inflammatory effects were observed. Read through our forum on Valencene below, or start your own topic. This forum contains 673 topics, and was last updated by FuanyLx 5 days, 5 hours ago.